That time of summer is approaching when you stay glued to the TV for an entire week, the theme song from Jaws runs through your head constantly, and you vow to never step foot in Virginia Beach’s Oceanfront. Ever. Again. Welcome to Shark Week. 1. You don’t have to be a hammerhead to nail this paint job. 2. This is one Shark Bite that doesn't hurt, at least not until the next morning. 3. Bake these tasty shark cupcakes. 4. Or for a healthier option, make a sharkmelon. 5. Shark sandwiches are a must. 6. As you spend every second of your free time in front of the TV, wear these shark socks to keep your tootsies warm and stylish. 7. Ladies, if you feel brave enough to head to the Virginia Beach Oceanfront, sport this sharkini. That’s the tan line you always wanted, right? 8. Don’t worry, guys. We’ve got you covered, too. 9. 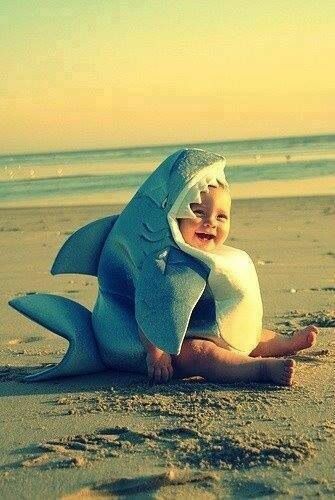 Even the smallest member of your shiver can participate in the sharktivities. 10. Hit up these events happening in Coastal Virginia, like Sharks at the Virginia Living Museum and Shark Shenanigans at the Virginia Aquarium & Marine Science Center. 11. Only the coolest people have shark ice cube trays. 12. To show how dedicated you are, you’re going to want a shark tattoo for sure.